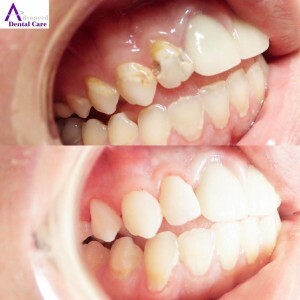 Read this article to find out more and then schedule your Complimentary Consultation at our Costa Mesa dental office. 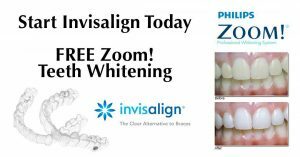 Who can benefit from Invisalign treatment? Invisalign can treat patients with malocclusion – overbites, underbites, crossbites, gapped teeth, open bites, crowded teeth, and mainly straight teeth that need minor adjustments. Malocclusion causes affects teeth, gums, and the jaw and can result in severe pain, bruxism, gum disease, and even tooth loss. The benefits of Invisalign go beyond straightening teeth to give you a more beautiful smile, it also improves the health and longevity of your smile. 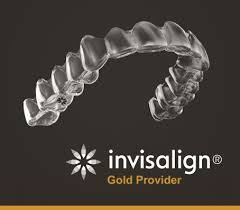 Invisalign treatment works just like traditional metal braces, but provides the convenience and privacy desired by using clear aligners made of a special thermoplastic material. 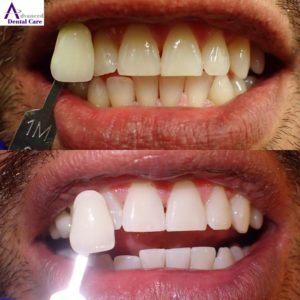 The trays are strong enough to cause teeth to move and thin enough to be virtually invisible. The amount and timing of pressure applied on the teeth is no accident. Your case is designed just for you! Dr. Jeremy Jorgenson and the Invisalign laboratory work together to provide you with a custom course of treatment to move your teeth to the right place at the right time. Invisalign treatment time can range anywhere from a few months to up to several years. 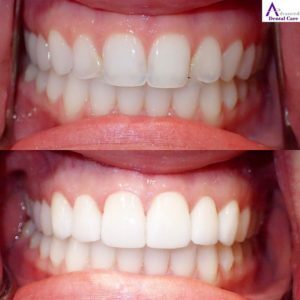 Every smile is different and treatment time depends on how much and what type of movement is needed to get your teeth into the proper position. Scheduling you iTero 3D scan is the first step to determining treatment time. You can book anytime online at www.mycostamesadentist.com. Can I eat with the Invisalign trays? YES! You can eat anytime, anywhere, and anything without having to worry about every meal getting jammed up in metal brackets like traditional braces. When it is time to eat, simply remove your Invisalign trays, put them in your personal carrying case, and enjoy! After you’re finished, just pop them back on and you’re back in action. We do recommend brushing or rinsing your teeth before putting the trays back in. Can I take my Invisalign trays out to brush and floss? YES! Take your Invisalign trays out to brush and floss in the morning, in the evening, and after meals. Any discomfort from Invisalign treatment is mild and experienced mostly when you switch to a new set of trays as this is when the pressure is the most. Nothing ibuprofen can’t help with in most cases. You may experience a slight change, but once you get used to speaking while wearing your trays there is typically no noticeable difference in speech. 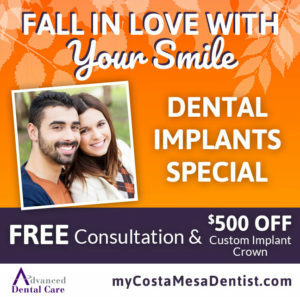 You can be assured that at Advanced Dental Care in Costa Mesa, the fee for Invisalign is totally all-inclusive. No surprises at the end of treatment. The total cost of Invisalign depends on whether you are an Express case or a Full case. The fee covers the initial consult, all photographic records, your 3D model digital scan, the initial delivery and placement of any attachments, and all visits thereafter. 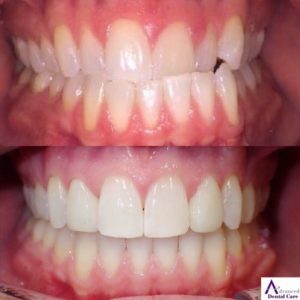 Our fee also includes any additional trays needed at the end of treatment, called refinements, to ensure your smile and occlusion are right. The value is priceless. The cost ranges from $3000-$6000 and worth the investment in your health and appearance! It might and we would be more than happy to check your dental insurance coverage and benefits at no charge. Just give us a call or shoot us an email. We just need a few pieces of information and can let you know within 10-15 minutes in most cases. What is the difference between Invisalign and other companies like Smile Direct Club? Everyone wants Invisalign. Of course, it was only a matter of time before other companies would catch up to this clearly amazing treatment. Orthodontic procedures are major dental treatments that change bone and affect the structures in your mouth. Invisalign is patented, proven technology that works! Your treatment is designed, produced, and overseen by Invisalign certified dentists. You can feel confident knowing that you are in good hands with your most valuable asset, YOUR SMILE! When choosing a provider, you want to ensure your dentist is trained and experienced in Invisalign treatment. 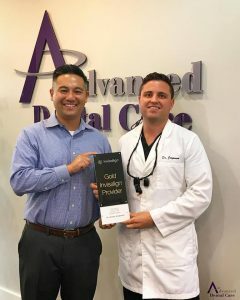 That’s why so many patients trust Dr. Jeremy Jorgenson with their Invisalign treatment and that’s why he has become a the top Gold Invisalign doctor in Costa Mesa. On your initial visit, you will meet with Dr. Jeremy Jorgenson, a Gold Invisalign provider, to discuss your smile and how Invisalign can help you. Dr. Jorgenson will perform a visual consult and take a series of smile photos to document your current teeth, gum, and jaw position. If you are a good candidate for Invisalign, we will take a 3D digital laser scan of your smile using the latest iTero digital technology. The scan produces a 3D digital model of your teeth, which is used to determine exactly how and where to move teeth to achieve a straight, healthy smile. You’ll be able to see how Invisalign can improve your smile with the iTero Outcome Simulator. Dr. Jeremy then works with the Invisalign laboratory on each case to design a custom treatment plan. You’ll be prescribed however many sets of aligners are needed to move your teeth. When the trays arrive, you will come back to our office where we will apply any attachments and go over the at-home process and care. You will pick up several weeks of aligners at one-time and change to the next tray in the series every 1-2 weeks. Each aligner gradually shifts your teeth closer to the desired end result. In no time, you will be smiling ear-to-ear showing off your brand new smile. Call (714)424-9099 to schedule your complimentary consultation today! Advanced Dental Care is a full-service dental office located at 3033 Bristol St. Ste. AA, Costa Mesa, CA 92626 offering morning, evening, and weekend appointments.